"Stars & Stripes" is a fitting name for this emotionally resonating expedition that explores the legacy of Pearl Harbor and its profound impact on world history. After Pearl Harbor, sit back for a narrated drive to the National Memorial Cemetery of the Pacific at Punchbowl, where many American men and women who died fighting for their country are buried. The trip culminates with a drive through historic Honolulu to see the area's noteworthy landmarks—Hawaii State Capital, Honolulu City Hall, Iolani Palace and Kawaiahao Church. The Memorial is located about 2 miles west of the Honolulu Airport in Pearl Harbor on the island of Oahu. The Memorial is managed by the National Park Service (NPS) and consists of a shoreside visitor center (VC), where the tours begin, and the Memorial located in Pearl Harbor. The Memorial is accessible only by the NPS tour from the visitor center. The VC is open 7:30 am to 5:00 pm, seven days a week except New Years Day, Thanksgiving and Christmas. Tours begin about every 15 minutes from 8:00 am to 3:00 pm. The tour programs are free and new, souvenir tickets are available on a first-come, first-served basis. Each person must obtain their own ticket. During busy summer and winter holiday periods, it is recommended that you arrive at the VC before 12 noon. There are no age or size restrictions, but children under 5 years old must be accompanied by an adult. Appropriate dress is required, no swim wear or bare feet. 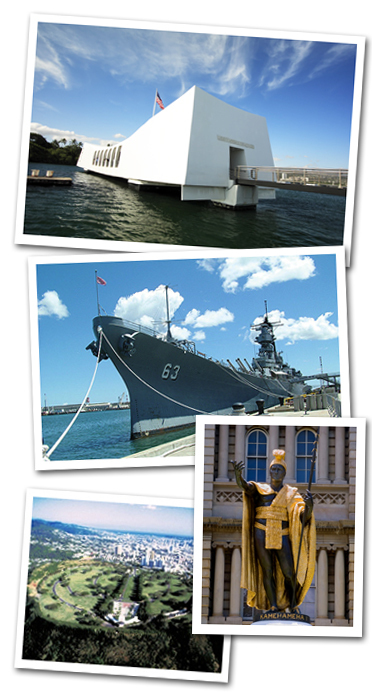 The tour program consists of a brief introduction by a park ranger, Pearl Harbor survivor, or volunteer. A 23 minute film on the history of the Pearl Harbor attack follows. After viewing the film, visitors board a Navy operated launch for the Memorial. The entire program takes 75 minutes. Wait times for the tour may exceed 2 hours. While waiting for your tour to begin, there is an excellent audio tour narrated by Academy Award winner Ernest Borgnine available. The audio tour will guide you through the Visitor Center, museum exhibits, and backlawn exhibits. The audio tour will provide you with interpretive information on the shuttle boats and on the Memorial. Visit the bookstore where a wide range of materials on the Pearl Harbor attack may be purchased. Departs daily between 6:00 am and returns approximately 2:30 pm. Shoes must be worn. Cameras permitted. Storage is available at the entrance to the USS Bowfin for a nominal fee. Children under the age of 4 are free and must be seated on an adult's lap. If you require a seat for a child under 4, you must purchase a child's admission.